This fantastic ticket includes all the elements of the Kennedy Space Center Admission Badge, including the Rocket Garden, the Shuttle Launch Experience, two IMAX films, KSC Bus tour with the Saturn V Center and the Atlantis Exhibition plus a once-in-a-lifetime opportunity to have lunch with a real life astronaut and a choice of exclusive tours to areas normally accessed only by NASA personnel. Lunch with an Astronaut Program - once-in-a-lifetime chance to have lunch with a real life astronaut. Hear about space adventures first-hand from someone Who has experienced a launch and the wild ride into orbit. Kennedy Space Center Explore Tour - a 2 hour tour offering access to areas Otherwise open only to NASA personnel: such as the Space Shuttle launch pads. Drive by NASA’s KSC Headquarters, operations buildings and Launch Pad 39B. Disembark for photos at the NASA Causeway, Vehicle Assembly Building, and camera bunker with views of launch pads and the Atlantic Ocean*. 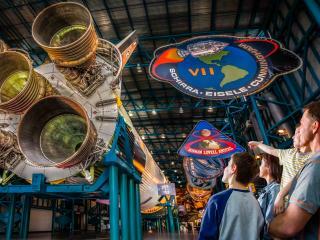 2nd day FREE admission - For a limited time the Kennedy Space Center Space Pass also includes a 2nd day FREE admission to Kennedy Space Center Visitor Complex. The Space Pass is issued as a voucher and is easily exchanged at the voucher redemption window at Kennedy Space Center entrance. It is strongly recommended you book a date in advance for the Lunch with an Astronaut Experience and KSC Explore Tour. Both elements can sell out at busy times and can not be guaranteed on the date you visit without reservation to advance. You can Either make a reservation once you are in Orlando by calling the number detailed on your voucher or you reserve your date at the time of booking. Car parking is not included in the ticket price, appoximate cost is $ 10 per car, payable locally. *NASA reserves the right to cancel or alter locations and/or security requirements for the Kennedy Space Center Explore Tourwithout notice.